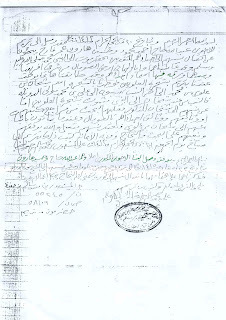 The Signed Affidavit from Hadramout attesting the Kawayni Family's lineage to be correct from Shaykhan b. Alawi to the Prophet Muhammad (s). Brother I am a descendant of Hasan Kawayne living in UK. I know the sheikh who met the silte in Nazret in the 70's. He is actually in Dire dawa now. Faisal, the guy you met in Dire dawa knows him. I don't know if Faysal knew this but the sheikh gave me the account of this meeting first hand. Probably you have met him and you didn't mention but he and haji Jamel met in 1974. He actually told me in 2006 that he went to Jijiga to buy corn but went all the way to Nazret because he couldn't find enough quantities. In Nazret after completing his purchase he met an Ogadeni man who he knew in Qabridahar who told him that the owner of the store (i think he said haji Jamal) was a descendant of Ali Said Hasan. This shows that at least some siltes were well aware of who they were before the Hasani sheikh met them. How else will an Ogadeni sheikh (Haji Abdirahman)know the relation between his new friends the Haji Allis and his old ones, the Hasanis. Almost all Hasanis believe that the descendants of ALI SAID Hasan went to the lands west of Harar and still live there while the rest of us went southwards from Harar migrating with the Sade Somalis who moved from Harar to what is now known as Ogaden. Another proof is the fact that all Hasanis maintain Ali Said as an existing brunch of the Said sub-clan when there are no known descendants of Ali Said in anywhere in Somalia. Hi, my grand dad's name is Sharif Maxamud Cabdiraxman. He was the founder of the Somali Muslim League in the early 50s. History says that he was born in a village close to the town of Luuq and to be the border with Ethiopia. He then went to live around Baidoa and was among the few Somalis that had the opporunity to go and study at AL AZHAR in the early 1920s. He had kept a book with all our genealogy but unfortunately because of the war, we lost it. Now I am willingto share and find out about my genealogy and that of the Ashraf Sarman. Can you help with that? Thanks brother. You might wanna check the comments every now and then. Iam not sure if this would help you or not, but let me clearfiy few things you heared but not sure of. First of all the 9/or 7 saints from Mukha who landed in Zaylac were not in the 16 century, they were in the 12 century and among them shariif Yuusuf Al-Kwaynayn and Sayid Isxaq Ibn Ahmed Al Ridhawi. Yuusuf Al Kawanayn was a Hasani Shariif and they are buried in Awbarkhadle (80km west of hargaysa) and Mait east of Berbera respectivly. Now when it comes to the book of Fatax al Xabasha you have to know its not complete and it has many versions. 1- Buqyat Al Zamaan Fi Taariikh Al Soomaal. 2- Tuxfat Al Mushtaaq fi Nasab Sheekh Isxaaq. The other book which may contain few informations on Ahlu Al Beyt in east Africa is one by Axmed Al Jeezaani titled "Tuxfat Al Zamaan" this last book in his 2nd Jiz contains some genealogical data , walaahi aclam. I am familiar with Silt'i genealogy, and I came across this book that contains the whole genealogy of the Ba'Alawi, including historical information about the branch that Hasan Kawayni and Hajji Ali are descended from. Sarman is a name of a cave in Iraq where Immam Al Mahdi is hidden according to Shia believers.